I have been listening with the utmost interest to the words of Bishop Forte and of Cardinal Martini, and it is difficult for me to put forth yet another topic of discussion after two such intense interventions. The latter focused especially on the future, urging us to gaze beyond past events, whereas I shall attempt to examine the reasons for the theological and religious opposition between Judaism and Christianity. Therefore I shall concentrate in a special manner on the past. At the same time, I would like to project this topic from the past into a future that concerns us both and towards which we are going together. Considering the complexity and the controversial nature of the problems under discussion, as well as the short time we have today, my talk shall be very brief. I would like to preface my considerations with a general observation that is also meant to be an expression of hope for the future. Jewish-Christian dialogue  despite the limits, the flaws, the disappointments, the criticisms and the attacks which it continues to cause  is a dynamic reality; we are not in a situation of stasis. And I would like to quote, applying it to us, a verse from the Book of Deuteronomy (5, 3): We, all of us who are alive here this day, are armed more with good will and hope than with wisdom and certainties. The comparison between Christianity and Judaism typical of the past centuries is not that of today; yesterday there were theological disputes, and the Jews were unilaterally asked to attend public assemblies where they had to justify their continued allegiance to the faith of their fathers. Today, Jews and Christians in the spirit of dialogue meet in very different circumstances and with markedly different attitudes. It is nonetheless difficult to deny that from a part of the Jewish world, rabbinical and not rabbinical, there is still a certain resistance, a difficulty about entering into a relationship with Christianity in the context of the initiatives of dialogue. This happens for a series of reasons; some of them are clear and evident, some are less so but do nonetheless exert a determining influence on our relations. There is of course still the fear or the suspicion that the true goal of the Christians is to attract the Jews to Christianity through dialogue, or that through these contacts those Jews who are less religiously motivated, and thus are more fragile, may be induced to abandon their religion and to embrace Christianity. I have the impression that, from a preliminary and substantial point of view, the true reason behind this resistance is not tied to a subliminal fear or reluctance, but is connected with considerations of a doctrinal type: unlike Christianity in relation with Judaism, Judaism does not need Christianity to understand or to comprehend itself. Today there is a tendency to talk of an asymmetrical relation that connects Jews and Christians at the level of dialogue. In other words, for a Christian the encounter with Israel means the rediscovery of ones own roots, so that Christianity is more clearly defined, understood, and, so to speak, better justified. For a Jew the encounter with Christianity does not carry the same significance. On the contrary, in this second case, the encounter with the other becomes a source of tension and contradiction as soon as the figure of Jesus comes under discussion (and how could it be otherwise?)  a figure that, understood as divine and messianic, contrasts with Israels monotheistic or messianic conception. It is also necessary to add that within Christianitys religious doctrine, where we meet with openness and readiness to change as well as with resistance and hesitation, there are still serious difficulties whenever one tries to define and to indicate the role of the people of Israel. As an example, I am thinking of the interpretation given by the Church of the return of Israel to its land after two thousand years of galut (exile); is it a providential event within a theological vision or a historical and contingent event within a political perspective? I could continue to discuss these issues, adding yet other considerations, but I am not going to do so, since this is not the issue on which I intend to focus tonight. I would like to bring the discussion to a different level, no longer assessing the Christian theological understanding of Judaism, but rather, starting from inside the Jewish tradition, attempting to outline and evaluate the main points of a Jewish theological understanding of Christianity. The latter, even if essential, is not univocal; it is contradictory, and is still being worked out. Its elaboration is certainly a very difficult and delicate task, whose starting point is the study of the definitions of Christianity given by the Jews in the past; and I am thinking here especially of the Talmudic and the Medieval period. The question where all discussions arrived and converged, and thus also the main problem to be solved, was whether the Christians had to be considered idolaters or not. In the Talmud we find a distinction between the goyim (including the Christians) living in the land of Israel and the goyim living outside the land of Israel. In order to absolve the former from the accusation of idolatry, it was necessary to make sure that they truly did not practice idolatry; for the second, the presumption that they were not idolaters was sufficient. There is a passage in the Talmud (b. Hullin 13b) that seems to say this: The idolaters outside Israel are not idolaters, since what they do is to practice, out of habit, the rituals of their fathers. I have translated [into standard Italian] a technical expression that means this: "performing certain practices," they do not show a clear intention of celebrating idolatrous rituals. Why do we find this difference of evaluation between those living in the land of Israel and those who are outside of it? Most likely, the Christians of the Holy Land mentioned in the Talmud are the first Christians, the Judeo-Christians, the church of Jerusalem, the church of Jacob, those who had known and practiced the Jewish religion and had subsequently abandoned it. These ones, therefore, knew what they were doing, they knew that they were violating the precept of the yihud ha-Shem (the unity of God), according to which God (ha-Shem) is One (ehad), a precept that concerns those who are born Jews and not those who are outside the people of Israel. According to some, there is a subtle distinction: the descendants of Noah (those non-Jewish individuals who, like the Christians, obey universal moral laws) are subject to the prohibition of idolatry, but are not obliged to embrace monotheism. Thus shittuf (the association of other divine figures to the one God, as in the case of Jesus) can be practiced by them without breaking the prohibition of idolatry, considering that they are not obliged to profess monotheism. With the passing of time, especially in Medieval Europe, the situation would undergo a radical change. On one hand, idolatry in the proper sense of the term would disappear, and with it also the necessity to fight it. Christians and Muslims would control Europe (the Muslims until the fall of Grenada in 1492). The Jews would have to deal with them in their different roles as rulers and as representatives of different religions. What is the Jewish approach towards Christians and Christianity in the Medieval period? Does this approach change in comparison with the Talmudic period, or does it remain unvaried? In general, one must distinguish between the (Sephardic) rabbis residing in areas under Islamic influence and the (Ashkenazi) rabbis residing in areas under Christian influence. The Sephardic front is authoritatively represented by Maimonides, who, if compared with the diversified position of the Talmud, takes a more radical and univocal stance, eliminating the distinction between the inhabitants of the land of Israel and those living outside Israel, treating all Christians as idolaters tout-court. Next to this negative vision of Christian theology, Maimonides does however give a more open and moderate assessment of the Messianic role of Christianity and Islam in the world. Here is for instance a passage of the Treatise on Kings, which does not appear in all editions (of the Mishneh Torah), because in most of them it is censored: To understand the thoughts of the Creator of the world is not possible to man, because our ways are not His ways and our thoughts are not His thoughts (Is 55,8); nevertheless, all the words of Jesus of Nazareth and of the son of Ishmael [Mohammed] who came after him are aimed at paving the way to the King-Messiah and at preparing the whole world to serve God together, as it is written: because I shall then transform the language of the peoples into a pure language, so that all shall invoke the Name of the Lord shall serve him in a sole unit [all together, in harmony] (Sof. 3,9). 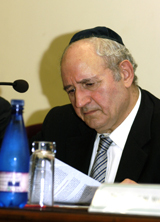 Following the line of thought begun by Yehuda ha-Levy in the Kuzari, Maimonides lets Christianity and Islam, so to speak, do a qualitative leap: he includes the two religions within a sole providential plan that sees them as protagonists of a preparatory itinerary of humanity as a whole towards the Messianic event. In the so-called Ashkenazi world, where we find personalities such as Rashi, the Tosafists, and other rabbinical authorities who carry much weight in the French-Germanic environment, it is emphasized that the Christians (in the countries where the Jews lived) are not idolaters. We can therefore see a rather marked distinction between the evaluation of the Christians given by the Sephardic world represented by Maimonides and the evaluation given in general by the highest authorities of the European Ashkenazi world. According to the latter, the Christians are not idolaters, or they do not know of any idolatrous practice, or  echoing the well-known claim by Rabbi Yohanan mentioned earlier (from the treatise Hullin of the Talmud)   what they do is to practice out of habit the rituals of their fathers, without any intention of thereby carrying out idolatrous practices. In such a delicate context, we ought to mention a rather odd circumstance. In a very important halakhic text (the Tur by Yaaqov ben Asher), the controversialist and jurist Joseph Caro explicitly mentions that at the present time [we are in the 16th century], the Christians believe in the Creator of the world and thus are not to be considered idolaters. In another work of his, the codifying treatise Shulhan Arukh, the same Joseph Caro does however fail completely to mention his conviction as a halakhic norm. Within this complex horizon, a special case is represented by the position of a famous 14th century scholar from Provence, Rabbi Menachem ben Shelomò ha-Meiri (1249-1315). He thinks that Christianity has nothing to do with idolatry and that the prohibitions mentioned in the Talmud about the idolaters do not concern the Christians. Thus he writes: even if their faith is different from ours, they do not belong to the category of idolaters; they believe in the existence of God the Blessed One, in His uniqueness and omnipotence, even if in some respects, from the point of view of our faith, they incur in some errors; and later, in our time, in the majority of cases, even if sometimes they share oaths in the name of important dead personages [the saints], they nonetheless do not consider them deities [and thus there is no idolatry]. Meiris position is certainly remarkable and authoritative, even if these conclusions of his, which appear wholly to exclude Christianity from the problematic of idolatry, seem to be rather unique. In such a tormented context, characterized by contradictory positions and thoughts, sometimes oriented towards a more moderate appraisal, sometimes towards a more critical judgment of the Christian religion, Maimonides ambivalent opinion  negatively on the theological level, but positively open in its Messianic perspective  appears to be the clearest and most straightforward affirmation of the involvement of Christianity in a providential role of a Messianic-providential type. And this opinion continues to represent a major stepping stone in the path that Christianity and Judaism make together, though along parallel and distinct planes. Maybe even the category of the descendants of Noah, which is admittedly rather inadequate and weak, may still be used to think of Christianity in Jewish terms and to reconcile conceptually (and not only conceptually) the two religions. Let us not forget that in the past century, in the heart of a European continent that some thought most civilized, we witnessed the explosion of the Shoah, with its burden of suffering and death  and the idea of dialogue came as a consequence of the Shoah. As I said, dialogue continues and must be sustained because it is a unique occasion to think and to speak together: the only open road which we can both follow so as to be present, together, whenever God shall so desire. Things that are hidden belong to the Lord our God (Deut. 29, 28). As far as we are concerned, and as was just emphasized by Cardinal Martini, we should not behave as if we were in a rush; we ought not to have too many certainties (personally, I have more questions to make than answers to offer); we ought not to be tempted to wake up love (Song of Songs 2, 7) before it is time. Thanks to our faith, we must be optimistic; we must be trusting and we must be convinced that, when the moment shall come, God shall open our eyes and our hearts, showing us the truth. Thus, we must be alive and walk together in the direction of that goal, with sentiments of love, respect and humility.